Hi friend! I hope you’ve been having a splendid week! I’m up at my friend’s cottage on Lake Huron for the next few days and so I’ll make this post short and sweet, just like me! Sometimes you just want to be able to grab and go your breakfast, but when you’ve switched to a whole foods lifestyle and especially if you’re avoiding grains, it can be hard to find things to eat when you just don’t have the time to whip something up. I’ve already shared my recipe for Protein Packed Pumpkin Pie Pancakes, which can be a great option, but today’s dish is more on the savoury side. They freeze and reheat well and are super delicious and easy to make. Eggs are one of my favourite foods and they’re chock full of B vitamins, choline for healthy brain function, and they’re a fabulous source of protein. Coconut milk contains healthy medium chain fats to help boost our immune systems and to provide energy for our livers. Spinach is chock full of chlorophyll which is fab for detoxification and contains tons of vitamins and minerals necessary for a healthy and happy body. These egg cups are great because they’re totally customizable and you can throw in any veggie you want. Peppers for vitamin C, tomatoes for lycopene, or garlic for sulfur compounds that support your liver. Go crazy and get creative in the kitchen! Grease 12 muffin tins with coconut or olive oil. You could also use a slice of natural, preservative free ham or turkey deli meat. Whip eggs and coconut milk together. Add chopped veggies, spinach, sea salt, and pepper. Pour into lined muffin tins. Bake for 15 minutes then rotate and bake another 10 minutes or until edges are golden brown and middle of egg muffin is set, but still soft. Remove from oven and let cool in tin 1 minute before placing on a cooling rack. Can be frozen or stored in the fridge for 5-6 days. Thanks for stopping by friend! 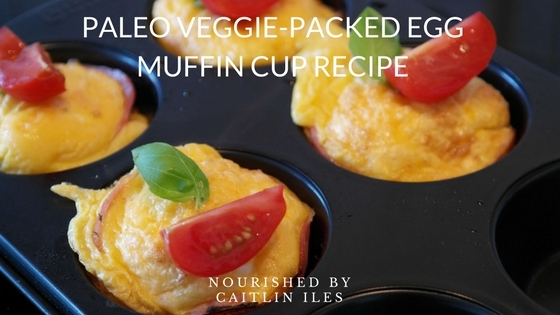 If you’re looking for more deliciously satisfying, quick & easy breakfast ideas make sure you download my FREE Sensational Smoothies E-Book here. Have a beautiful day!